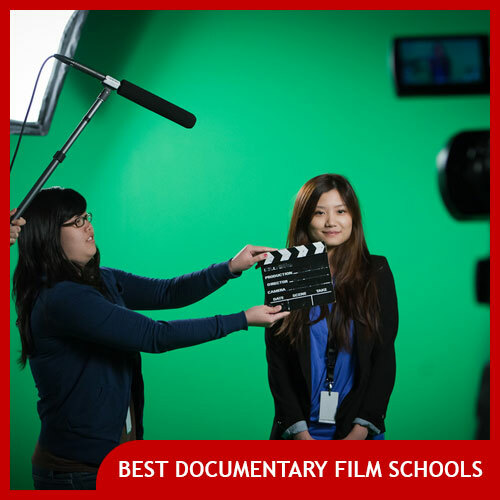 DSLRs produce amazing visuals with blurry backgrounds and shallow depth of field. 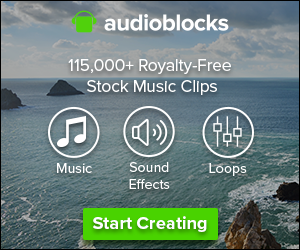 But when it comes to audio, out of the box most DSLRs for filmmaking are kind of… terrible. One solution is to get a DSLR audio adapter which allows you to plug in professional shotgun microphones with XLR cables. Another option, easier and less heavy, is to simply get a DSLR shotgun microphone to begin with. 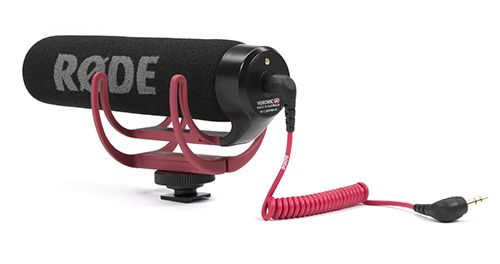 The Rode Videomic is the best known DSLR microphone on the market. It’s well known by indie filmmakers for providing an affordable on camera shotgun microphone that’s a million times better than any DSLR’s chinsy-sounding on board microphone. 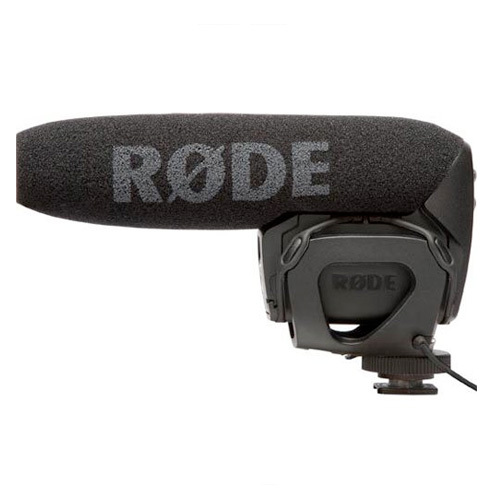 The Rode Videomic offers a cardioid pickup pattern, meaning it will seek to eliminate background noise and isolate dialogue, and comes with a shockmount to minimize handling noise of your hands on the camera (which onboard DSLR microphones are notorious for picking up in the worst way possible). The Videomic is battery powered by single 9V and connects to your DSLR with a 3.55mm (1/8th inch) standard microphone input that almost every filmmaking DSLR has. The venerable Videomic also has a younger brother: the Go Mic, which uses the camera’s on board power and is lighter weight but doesn’t pick up sounds quite as far away. Sennheiser is well known in the industry for making great professional boom microphones, and several years ago they began making smaller shotgun microphones for DSLRs. 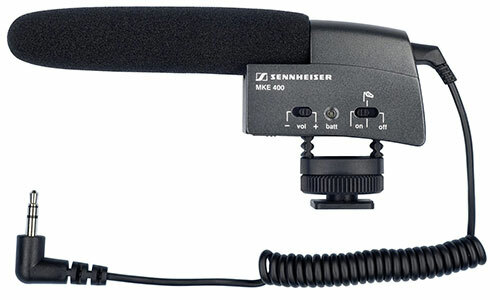 The Sennheiser MKE 400 is one of the best external DSLR shotgun microphones: it offers a rugged all metal housing (unlike the plastic Rode microphone housing), and runs on a single AAA battery for more than 300 hours. 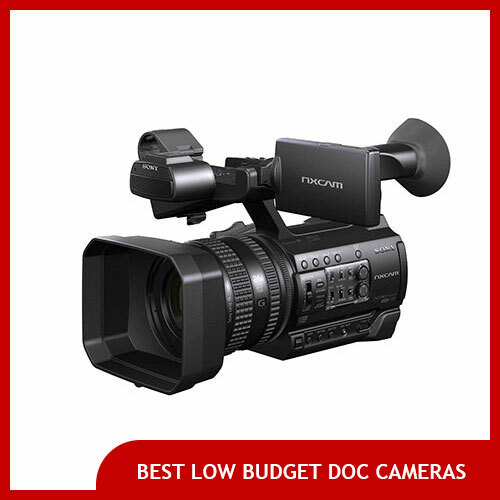 It plugs into your Canon, Panasonic, Sony, Nikon or other brand DSLR’s standard 3.5mm microphone port and has a switch to focus on close up sounds or far away sounds– something of a unique feature among DSLR mics. 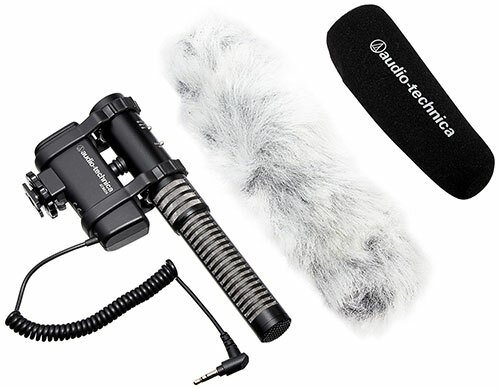 Audio-Technica is also a very well known manufacturer of pro filmmaking microphones. Their DSLR mic, the AT8024 is a stereo microphone that plugs into your DSLR’s standard 1/8th inch (3.5mm) microphone jack and is powered by a single AA battery. This AT8024 kit comes with a normal windscreen for indoor use and a “dead cat” furry windscreen for outdoor shooting in especially windy conditions to cut down on noise. The 8024 also comes with a shock mount to eliminate handling noise of your hands operating the DSLR and has a switchable low frequency roll off selector to reduce handling and wind noise further. The Rode Video Mic GO is one of the smallest DSLR mics available today, weighing less than 7 ounces, it sits in your DSLR’s hotshoe mount and produces much better sound than the camera’s onboard microphone. This kit comes with a shock mount, a coiled 1/8th inch cable to connect to your DSLR, and a “dead cat” wind muffler to cut down on wind noise when shooting outdoors. 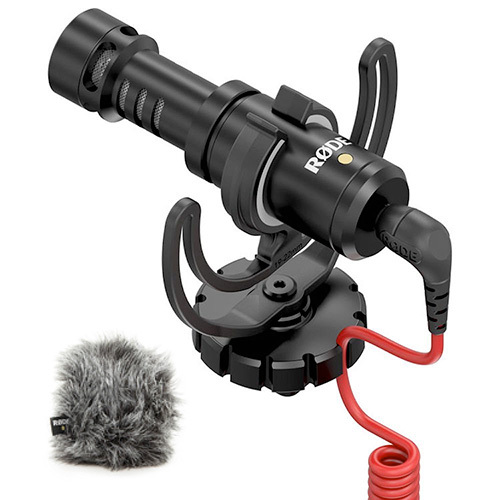 Because of its shorter length, the Video Mic GO will not be able to pick up sounds as far away as some of the other shotgun DSLR microphones on this page, but given its price and solid build, the Rode VideoMicro is our pick for best cheap DSLR microphone. The Rode VideoMicro is one of the smallest and lightest external microphones for DSLR cameras available today. It’s phantom powered, meaning it doesn’t require you to insert a battery; it simply sips power from your camera’s headphone jack port. It’s also quite a bit shorter than the typical shotgun microphone meaning it will pick up sound in a shorter range but it also won’t poke out into even the widest of wide angle shots because of its diminutive length. Also comes with a “dead cat” windscreen for cutting wind noise when shooting outdoors. Weight – Since you’ll be mounting this shotgun microphone directly on top of your DSLR or mirrorless camera you’ll want to make sure that it won’t be so heavy as to unbalance your setup or make it top-heavy. Size & Length – If you’re shooting a lot with super wide angle lenses, you’ll want to use a very short shotgun microphone so it won’t accidentally appear in the upper part of your frame. Similarly, the size of your shotgun mic for DSLR is also important if you’re using a rig or stabilizer. You’ll need to make sure there’s space for whatever microphone you choose and that it won’t be so large as to restrict your ability to access the camera’s controls. Battery Type – Some of the microphones in this list use AAA batteries, others use AA and still others use less common 9V rectangular batteries. 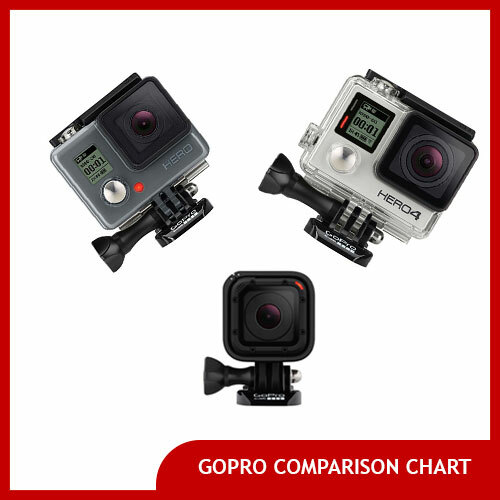 One mic on this list (the Rode Video Micro) is even powered by your camera’s on board phantom power, meaning it doesn’t require a battery at all. Whichever microphone you pick, you’ll want to be sure you know which type of batteries it uses. Some shooters find that it’s helpful to keep all their batteries the same type if possible (I.e. choosing gear that only takes AA batteries is one way to make sure you only need one type of battery on hand in the field). Others may consider this less of an important factor.